Year 10 student, Tirion Davies, and Year 12 student Jai Evans were invited to be part of a select student panel at the Prince’s Teaching Institute Conference for Maths and Science teachers. Jai and Tirion travelled to Crewe Hall Hotel on Saturday 18th November to address over one hundred Mathematics and Science Teachers about the importance of studying the two subjects. Both students talked about their love of Physics and Mathematics and the success they have achieved through passionate and inspirational teaching. After delivering individual speeches Jai and Tirion answered questions from the floor providing their views on a range of educational issues. Conference Leaders described them as excellent ambassadors for the school and the best student panel they have ever had. 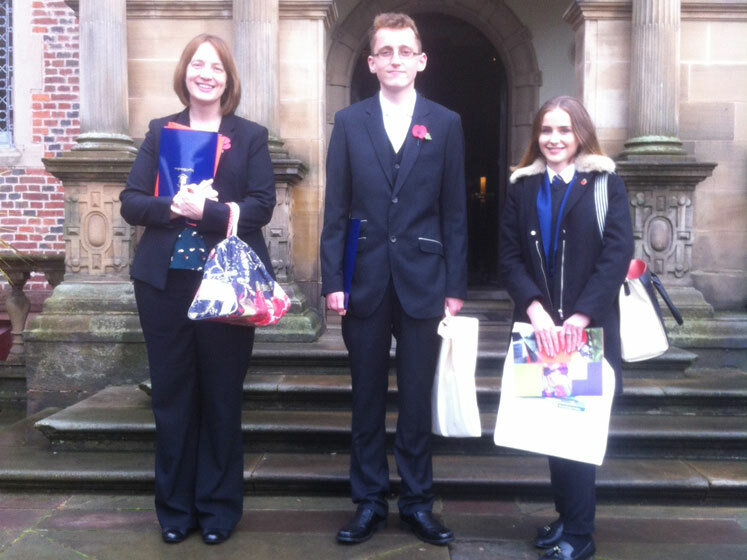 “We are very proud of Tirion and Jai who represented the views of our young people in such a mature, thoughtful way. We are also pleased that the Prince’s Institute selected students from Ysgol Rhiwabon to represent the views of young people in Wales”. The Cyw Christmas Show is Coming!